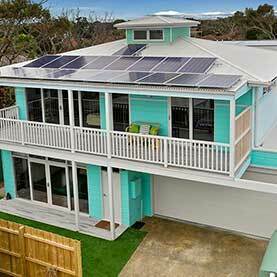 This unassuming new beach home is an energy conversion machine, generating more energy than it uses. It is a Zero carbon home. The surplus electricity it generates almost fully covers the supply charge and night usage. At this time the monthly electricity bill is $ 3.00 to $ 4.00 per month. That’s not a typo! Under four dollars per month! Forget the usual 10 Star blah blah or energy efficiency hyperbole…. this is the actual usage! The design was conceived, from the outset, to be efficient, light-filled, comfortable and spacious for easy laid-back living. 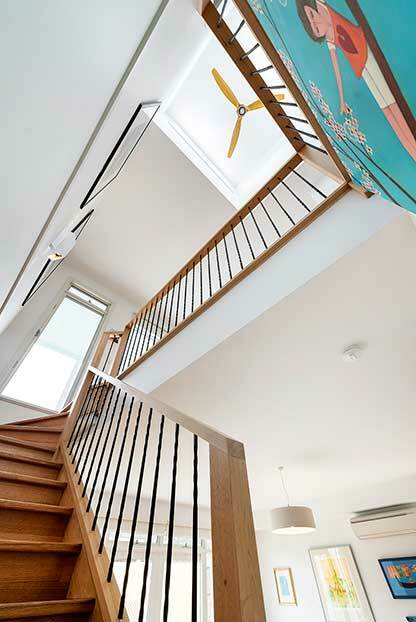 As Passive House members, Green Living Master Builders and long-time proponents of passive and efficient design, this home is the culmination of design and building knowledge distilled by the Capital Building design team over the last twenty years. This Capital (prototype) home uses passive and active design methods and appliances to achieve a delightfully efficient proposition. Passive design is shorthand for the building fabric (floor, roof, walls and windows) and its ability to maintain a constant and comfortable temperature achieved by certain design choices. Once in place, these building elements (orientation, materials etc.) are set and hard to change; hence passive. Therefore every building element needs to be viewed in this context at the design stage. Windows are the biggest weakness of the building fabric. Even well sealed double glazed units are only about ½ as well insulated as a well-insulated wall. Windows were thus kept to a minimum; to the South, East and West. A 5kW of solar panels on the roof generating the required power. 2 x 4kW reverse cycle, inverter, air conditioning units take care of heating and cooling. These units are very efficient and effective and only need to be run briefly until the desired temperature is attained. Meanwhile, the HRV unit circulates the desired temperature throughout the house. Hot water produced via a Heat Pump storage hot water unit. When you generate your own energy, there’s no use using anything other than electric appliances. Continuing along the theme of resource conservation, the house is suitable to be built on a small land size of 250 m2 and has its own separate mains water supplied by 10 thousand litres of filtered rainwater from 4 tanks. 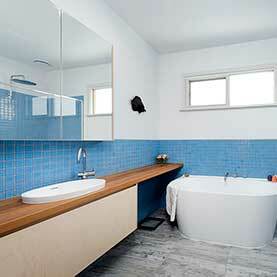 In the end, all this effort is about comfortable living in a pleasant living environment at an affordable cost. The owners are absolutely delighted with the performance of their new home and added their own personality at the design stage. They had input on the layout, façade, colours, selecting fresh casual finishes such as Russian Birch cupboards and recycled Aussie hardwood tops and floors, mosaic tiles and coastal timber look tiles reflecting the casual cool of a beach shack. Behind the understated facade and cool living spaces hides a truly high-performance home. If you are committed to quality, healthy, energy saving living for your family, contact Capital Building Contractors for your custom designed home of the future. To do it right a minimum budget of around $500K+ is required (Nov. 2018). 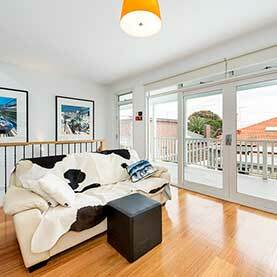 Bayside Beach House – Our Passive House Gem! 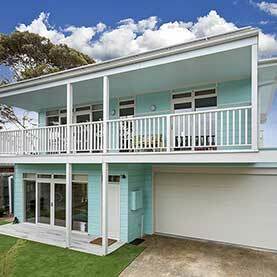 This Melbourne bayside home is the result of many years of Capital building and design experience and the clients brief for an affordable, energy efficient low key beach home. 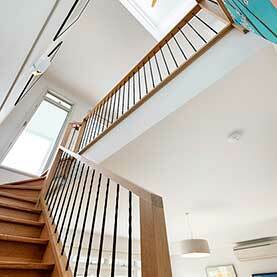 Sustainable passive and active design along ‘Passive House’ design principles. Sustainable, low maintenance home using durable efficient building materials. 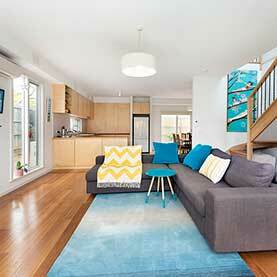 2 x large open plan user friendly living spaces, without space wastage. A small, spacious, north facing, garden adjoining main living areas. North Facing living areas with balconies and large double opening glass doors. Ceiling heights are: 2700mm or 9 feet. Passive/ natural ventilation (auto& manual) and active heat recovery ventilation HRV. External and internal air tightness membranes and seals to prevent condensation and drafts. Active electricity generation by 5 KW solar panel array, battery ready. 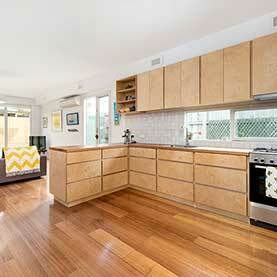 Recycled Timber benchtops, Timber cupboards and floors. Large 7 m by 6 m Garage. Water tanks with drinking water filter via mains pressure pump. All permeable outdoor spaces and garden. See the building journey of the Beach Shack.